Pregnancy should be a time of great joy. But for women in Uganda, who risk death or serious disability due to low-quality health services, it can also be a time of great peril. According to the 2011 Uganda Demographic and Health Survey, 438 Ugandan women die for every 100,000 live births in the country. This figure compares to 140 per 100,000 in South Africa and just four in Norway. The White Ribbon Alliance (WRA) Uganda has spent years working to protect the health of mothers. In the process it has built a broad-based network of decision-makers, organizations, professionals, and citizens committed to the issue of maternal health. 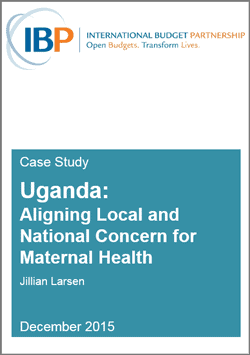 This case study describes how WRA Uganda developed its advocacy strategy during the Act Now to Save Mothers campaign. This innovative campaign combined grassroots mobilization and national lobbying efforts, all coordinated and timed to maximize influence on budgetary allocations to maternal health. The campaign offers a number of lessons for mature advocacy organizations looking to strengthen their effectiveness.